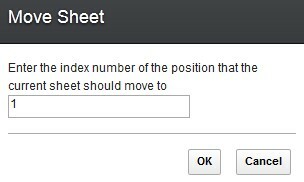 You can move a sheet in a spreadsheet. Click the tab for the sheet that you want to move. Click Edit > Move Sheet. You can also right-click the sheet name and select Move. The Move Sheet window opens. Enter the position to move to, and click OK.